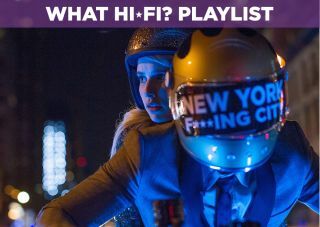 Nerve - Blu-ray review | What Hi-Fi? A high-school senior joins a mysterious online game, but eventually becomes controlled by the game's malevolent anonymous community. This line, delivered by the mother of protagonist Venus "Vee" Delmonico (Emma Roberts) at the film’s ending, could act as a pretty apt summary of the entire movie. Nerve is a dumb film trying to be smart. Vee is a shy photographer enamoured with a stereotypical high-school jock. When her popular friend Sydney (Emily Meade) spills the beans and he rebuffs Vee’s affection, she endeavours to come out of her shell and try something daring. That turns out to be ‘Nerve’, an online reality game where users are split into ‘Watchers’ or ‘Players’. Watchers pay $20 an hour to watch Players – who allow the app to access their social media accounts and bank details – enact outlandish or embarrassing dares like kissing strangers or singing in a restaurant. The more dares completed and filmed on the Player’s smartphone, the more money the Players get. Fail to complete a dare, break your phone or talk to law enforcement, and you’re out of the game. After performing a few low-stakes dares, Vee meets up with fellow player Ian (Dave Franco) and the two of them quickly become the most successful Players in the game. This comes with unexpected consequences, which put their lives at risk as they become “prisoners of the game”. Nerve asks us to question how much we trust social media and whether anonymity online is a good thing… except it asks those questions in the most insultingly lazy way possible. Any film that critiques technology needs to have an airtight depiction of it; anything too futuristic or dystopian in a world trying to be realistic will undermine it. Which is why it’s almost entertaining how misguided a view of social media Nerve has. Especially from a pair of directors, Henry Joost and Ariel Schulman, who are famous for making Catfish. In the film, the online game is played and watched on iPhones, despite being unknown to both Apple and the police. It is later revealed that the police are aware of the game but apathetic about it, for reasons that go unexplained. In this alternate world, Apple is surprisingly negligent, as ‘Nerve’ immediately violates its Terms and Conditions. Either that or everyone playing the game has used a ludicrously sophisticated HTML code to allow geolocation and camera access in their browsers. Since Vee needs a dorky friend to explain the basics of the Deep Web, this seems unlikely. Later in the film, people marked as 'Anonymous' make donations to Vee’s account – stumbled upon by her mother, who is not using the app. Riding a motorbike blindfolded at 60mph gets Vee and Ian $10,000 each, which seems a pitifully small sum of money to risk your life for. More importantly it means that the designers of ‘Nerve’ are so sophisticated that they have hacked into the bank accounts of thousands of people undetected. Vee and Ian later ‘beat’ the app by having every user log out – however those behind the game are never caught or given a second thought, free to strike again armed with all the user data presumably still on their servers. But that is deemed unimportant in comparison to Vee and Ian's blossoming relationship, despite Ian being explicitly untrustworthy and having committed acts tantamount to manslaughter. These glaring plotholes (many others remain unmentioned here, so as not to spoil the film for those who want to watch this train wreck) are built on top of the foundations of poor filmmaking. Vee's and Nerve’s, rise and fall happens in the space of a day, so the film’s pacing is far too fast to have any impact. This means that we spend little time with the characters, as the film keeps pushing them on to the next dare. However, that’s a blessing in disguise as they’re all one dimensional: shy girl, popular girl, heartthrob, dorky guy, creepy guy antagonist anyway.